This is continuation of article Login With Twitter Using Java. 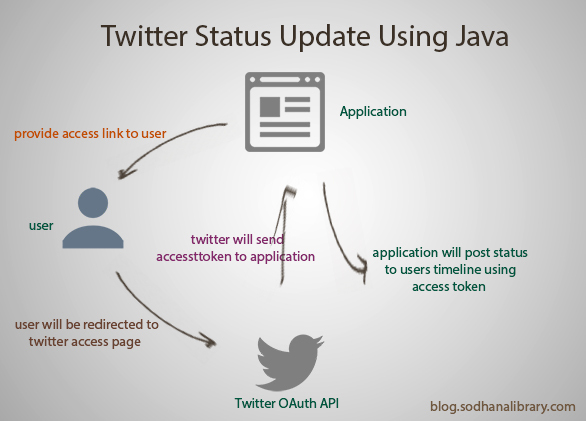 By using Twitter OAuth features, If you want to update status of user from your java web application, This article will help you. Suppose if you create a news sharing website, Your website will get more traffic if users share those news on their twitter's timeline. They can do that directly from your application if they given access to your application. Twitter is having java library twitter4j to access twitter services. Download twitter4j and add those jars to WEB-INF folder. There are 2 types of Update Status features are there. If you want to update status to your own profile, you can do it with default access token and access token secret. Observe below screenshot.